NASA's Mars Exploration Rover Spirit recorded this forward view of its arm and surroundings during the rover's 2,052nd Martian day, or sol (Oct. 11, 2009). Eventhough NASA's Mars rover Spirit has been trapped in the sand for months, therobot has still managed to report new facts about the red planet ? all by justspinning its wheels. Thesefindings shed light on the history of water on Mars, which might once havesupported life. Fornearly six years, Spiritroamed Mars, experiencing a number of close calls. In fact, the solar-poweredrobot has driven backwards since its right front wheel jammed in 2006. 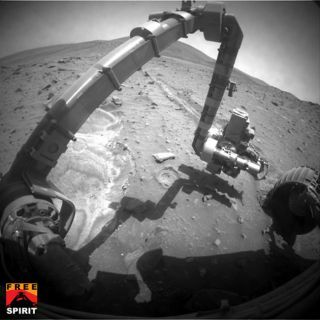 Spirit'smost challenging ordeal yet began in April, when it got bogged down in a patchof loose soil on the edge of a small crater. As scientists plotted Spirit'sescape for months, they dubbed the area Troy, after the city the ancientGreeks struggled against in myth for a decade. Asfrustrating as Spirit's dilemma has proven, it has yielded an unexpected insight. "Spirithad to get stuck to make its next discovery," said geologist Ray Arvidsonof the Washington University in St. Louis. "The rover's spinning wheelshave broken through a crust, and we've found something supremely interesting inthe disturbed soil." Spiritbroke through a dark reddish-brown crusty surface that was an inch or so thick,exposing loose, sandy material. As the rover tried to break free, its wheelsbegan to churn the soil, uncovering even more sandy material, bearing "a higherconcentration of sulfate that seen anywhere else on Mars," Arvidson said. "Sulfatesare minerals just beneath the surface that shout to us that they were formed insteam vents or hydrothermal pools, since hot water associated with thesesystems has sulfur in it," he explained. "These deposits are evidenceof water-charged explosive volcanism. Such areas could have once supportedlife." "Also,the robot found that the top of the sulfate material is crusty," Arvidsonadded. "Ancient sulfates probably formed this crust as they were processedby variations in climate associated with changes in Mars' orbit over millionsof years." Theangle at which Mars' axis tilts can vary extremely, and during periods when itsaxis is highly tilted, the pole facing the sun gets warmer during the summer,shifting water to the equator as snow. The scientists think the warm soilcauses the bottom layer of the snow to melt, and the water trickles into thesulfates, dissolving the water-soluble iron sulfates and forming a crust withthe white calcium sulfates remaining. "Bybeing stuck at Troy, Spirit has been able to teach us about the modern watercycle on Mars," Arvidson said.The robot's saga at Troy has given scientists material evidence of past wateron Mars on two time scales ? ancient volcanic times, and cycles ongoing to thepresent day. "Wewere never in one place long enough to really look at the layered nature ofthese deposits, which all fits with water migrating downward, giving us realinsights into the history of water on Mars," Arvidson said. Asuseful as all this time spent at Troy has proven, "we've sat here for morethan six months," Arvidson said. "That's a long time to takemeasurements. We've learned a lot. Troy is a good place to be under siege, butwe?re ready to leave." Spiritmay be able to break free to continue its journey after all. "Theright front wheel almost magically turned on a few days ago after we ran somevoltage through it," Arvidson told SPACE.com. "Hopefully it can giveus significant traction ? the probability of extricating Spirit has goneup." WhatLies in Store for the Mars Rovers?